A thunderous applause filled Phil Welch stadium as Regan Nash jogged into left field before the fourth inning. In that moment Nash, a University of Missouri Softball player, and a 2018 Mustang’s intern became the first woman to play for the St. Joseph Mustangs and in the MINK League. 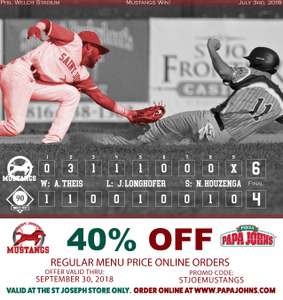 The Mustangs defeated the Ban Johnson All-Stars 6-4 on the historic night. The win brings St. Joe to 16-14 on the season. The Mustangs are proud to welcome our nations veterans to Phil Welch. All active duty and retired military personnel received two-free tickets to Tuesday and Wednesday’s game. Before the game fans were welcomed with a special American celebration and military hero ceremony featuring Team USA Baseball and Sky Divers. Trailing 2-0 in the second inning the Mustangs fought back. The bottom half of the lineup loaded the bases for Patrick Dillon who was hit by a pitch, scoring Terrance Spurlin. Zach Purdue followed with a sacrifice fly to right field bringing home Daniel Covert. Leading by a run in the fourth, Alex Phillips blasted a double onto the warning track in right centerfield. Zachary Smith came around to score all the way from first. St. Joe’s teachers got a front row seat to the actions as the Mustangs welcomed America’s educators onto the Hy-Vee party deck. St. Joe starting pitcher Adam Thies threw six innings giving up two runs while striking out four. Fans were treated to a special All-American tribute edition of the Mosaic Life Care Fireworks Spectacular. Alex Phillips went 2-4 with a double and a RBI. Terrance Spurlin went 2-4 with a run scored. Patrick Dillon went 2-2 with two RBI. Dillon hit his league-leading tenth double of the season. Nash became the first woman to play for a MINK league team. Come celebrate Independence Day with the Mustangs. St. Joe will be back at Phil Welch 7 p.m. Wednesday for a July 4 matchup against the first place Sedalia Bombers (18-7). Be one of the first 250 fans at the stadium and score a Phil Welch Stadium Replica, courtesy of Cody Vaughn and Thrivent Financial. The Mustangs are looking to decorate the stadium with the Kids Art Show and Auction. Kids 12 and under, submit your artwork to be displayed at Phil Welch Stadium. Artwork will be auctioned off to benefit St. Joseph Big Brothers Big Sisters. Stay after the game for a special Independence Day Mosaic Life Care Fireworks Spectacular.